One of my ‘must see’ moments at Christmas is the Frank Capra version of It’s a Wonderful Life, and yes, I can’t wait for the bell to ring as Clarence gets his wings. Originally, this was a short story that didn’t sell. Here listed to Edward Hermann (Richard Gilmore from the Gilmore Girls ) recount the original story, with how the movie came to be and an afterward from the author’s daughter. I am going to assume that you are familiar with the film It’s a Wonderful Life” starring Jimmy Stewart as George Bailey. I’m going to assume that you don’t need a synopsis of the story: for me one of the movies that means Christmas, and gives us all a look at one version of what could happen should your momentary “I wish I had never been born” comes true. This is the actual short story that was the basis for the movie, and how the movie came to be. The author’s original work has been ‘adjusted’ to change the last name of George from Pratt to Bailey, more closely making the connection to the film, but that was not a major difficulty for me. 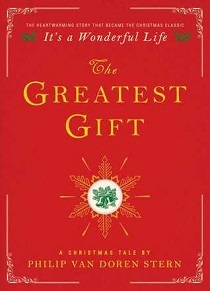 For me, finding the story’s origin makes the film that much more poignant: sent as a Christmas card in 1943, at the height of World War II both in America and Europe, the story of one man’s troubles, and the lesson he learns from that experience showed people then, and now, the importance and mark that every life can make. Narration is provided by Edward Hermann, probably best known as Richard Gilmore of the Gilmore Girls. Mellifluous and rich, his pacing and tone are perfectly suited for a reading, and his ability to pause for effect, while not imposing his emotions onto the narration allow readers to follow along and let the words speak their fullest. The afterward by the author’s daughter adds a touch of ‘setting’ to the story, giving history on her father, the time and the truly wonderful gift that this little story has brought to the world. Now fans of It’s a Wonderful Life, or anyone who loves the spirit of Christmas, can own the story that started it all in a charming audio edition that’s perfect for holiday giving. It includes an Afterword by Stern’s daughter, Marguerite Stern Robinson, that tells the story of how her father’s Christmas card became the movie beloved by generations of people around the world.